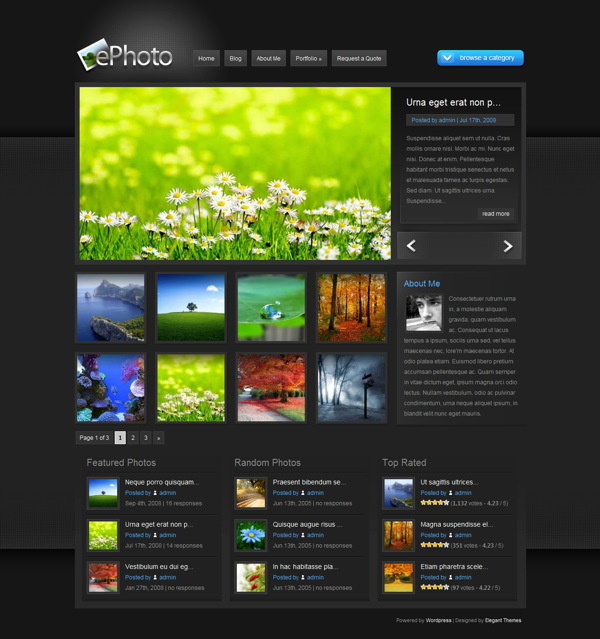 ePhoto was created for those looking to turn their blog into a photo gallery. While the theme was created with photographers in mind, it can certainly be used to display any type of digital imagery. While the main content of the theme is image based, I have also added the ability to create a separate blog page where normal blog posts can be integrated alongside your photos. ePhoto comes with two different skins. You can switch between either the Black or Blue versions at any time via the Theme Options Page. Along with your photos you can display normal blog posts in a different area of your website, complete with a blog-style post structure. This theme utilizes timthumb to automatically resize your thumbnail images. Because of this, only one thumbnail images is required per post, despite the various thumbnail sizes used in the theme. ePhoto comes with an options page that features a long list of settings that makes managing the theme as user-friendly as possible.